Sister Albertha Melinda Ferguson Eady was born on December 3, 1966 in Colleton County to Bishop Alfred Ferguson Sr., and Pastor Bertha Williams. Sister Albertha Eady was called home and transitioned from mortality to immortality on Thursday, June 21, 2018 at Colleton Medical Center in Walterboro, SC. Sister Albertha Eady attended the public school system of Hampton County, SC at an early age. She professed her faith in Jesus Christ and joined Jonesville New. Church of Christ. She later received her ministerial license from More Than Conquerors International Ministries in Walterboro, SC. She later joined New Covenant Fellowship Ministries where she served faithfully. As a result of her generous spirit and personality she was loved by many. Her Christian life was so beautiful as the flowers that she loved so well, and her influences will forever remain in the lives of all who knew her. She was preceded in death by her stepson, Tito Maurice Roberts and brother-in-law, Blane Taylor. She was an entrepreneur with multiple talents: floral designer, seamtress, baker, caterer and beautician. Her beautiful life will forever be cherish in the lives of her husband, Johnny L. Eady of Walterboro, SC. Children Jeremy (Amanda) Eady of Columbia, SC, Bridgett Eady of Walterboro, SC and Courtney Eady of Carrollton, GA. Four grandchildren T'Niyah, Zavion, Jayden and Jeremiah all of Columbia, SC. Parents Bishop and Pastor Alfred and Nora Ferguson of Charleston, SC and Pastor Bertha amd Ronnie Williams of Early Branch, SC. 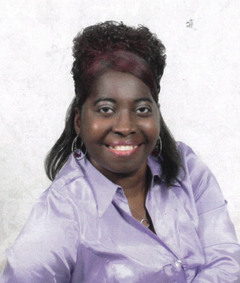 One sister, Alfreda Belinda ferguson White of Conway, SC. Two brothers, Reverend Alfred Ferguson, Jr., of Marietta, GA and Pastor Richard Ferguson of Ridgeland,SC. One Goddaughter, Ashley Ford of Macon, GA. One stepbrother, Ronnie Williams of Blackville, SC and two stepsisters Jessica and Candice Williams both of Orangeburg, SC. Four brother-in-laws, Abraham White of Greenpond, SC, Sammy Eady. Of Fairfax, SC, Anthony (Lena) Eady of Fairfax, SC and Charles Eady of Ocala, FL. Mother-in-law Mrs. Bessie Mae Eady of Fairfax, SC And Father-in-law Mr. John Edward Eady of Fairfax, SC. Fifthteen aunts and uncles. A host of nieces, nephews, cousins and friends.